We have two important results to share with you this year. 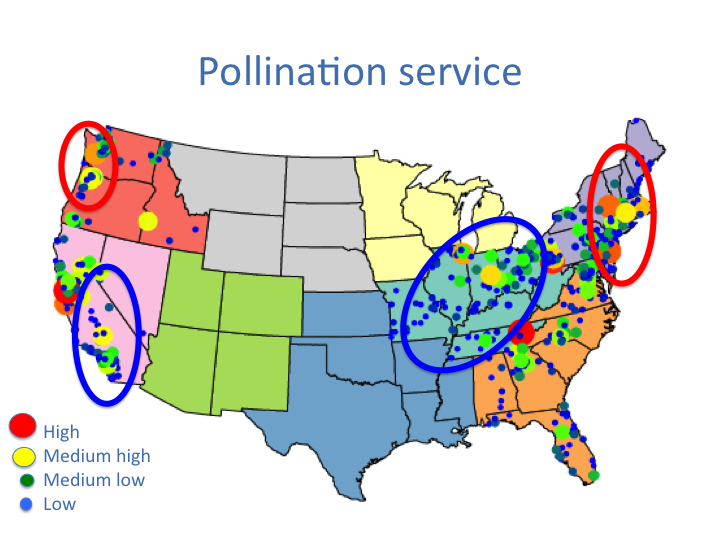 We've created a new map of pollination service for the eastern and western United States. We think this can be used to guide conservation efforts across the country. The map shows that central southern California and the Great Lakes region are areas of concern. We also are concerned about Florida and southern Georgia and Alabama. These maps differ from our earlier ones because we have taken into account the effect of the time of year that your count was taken. We presented these data at the American Geophysical Union this December and hope to publish the results soon. Reto Schmucki has done most of the analysis. This map is missing the central US. We discovered that we do not have enough gardens that have contributed four or more counts in any year to correct for the time of year. If you live in these regions, please help! We really want to include you in our analyses. Secondly, we have looked at pollination service across years and we are concerned about what we are seeing for 2016. While the number of counts coming in were fewer than in past years, the average across all gardens is lower than expected. We haven't taken seasonality into account for these data but gosh, we are a bit worried if this trend continues. Our 2016 data includes a lot of gardens in California which has been experiencing a long term drought. We plan to spend this spring trying to isolate the causes.